Situated at the quiet end of Karon Beach, this beautiful hotel boasts well-maintained grounds and pool area. You will be spoilt for choice as you sample the exceptional buffet spread for breakfast and the delicious cuisines served at the restaurants. Minutes away from the stunning beach, the pools are apt to soak in the gorgeous sea views. Centara Grand Beach Resort Phuket is a 5 star resort located on the Karon beach in Phuket, Thailand. The hotel is designed in the Sino-Portuguese architectural style and is a modern paradise for tourists. The hotel is a dream holiday destination for families, couples and large groups. The 262 rooms, suites and villas are elegant in looks, modern in comfort and very spacious. The air conditioned rooms have all facilities. Free parking is available for guests as well. Wireless internet and shuttle services are available on a chargeable basis. The resort has a fitness centre, spa and four swimming pools, with the star attraction being the water park, where families can enjoy hours together. A selection of restaurants and bars take care of wining and dining needs of guests. The resort is situated right on Karon beach. The resort is a 45 minute drive from the Phuket International airport. The Centara Grand beach resort Phuket has different types of accommodation to suit the needs of guests. All rooms are air-conditioned and have satellite TV, mini bar and a safe. Bathtub and shower are available. Deluxe Ocean facing and Premium Deluxe Ocean facing rooms give a view of the ocean. Spa Deluxe Ocean facing and Premium Spa Deluxe have a Jacuzzi in the room. Deluxe Pool Suite and Luxury Pool Suite are near the pool. One Bedroom Villa the Club, Two Bedroom Villa the Club and Royal Villa the Club are luxurious and spacious with living rooms. 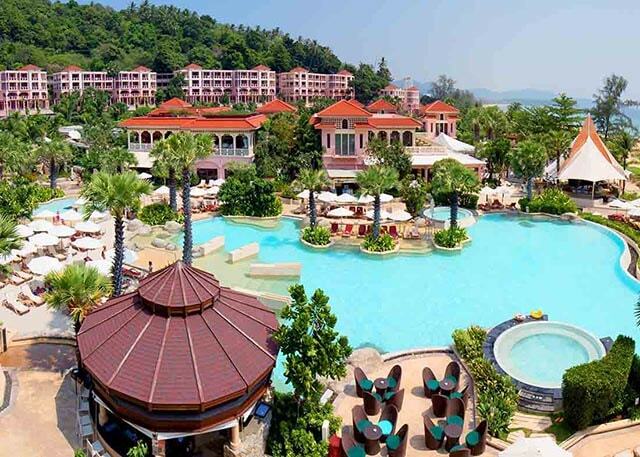 Centara Grand Beach Resort Phuket has a water park with waterfalls, water slides, Jacuzzi pool and a lazy river, where guests can relax for hours together. A kids club beckons the young guests. Kids playground and E-zone for teens take care of all guest needs. There are four swimming pools and a children pool. The award winning Cenvaree Spa offers therapeutic massages and aromatherapy. A fitness centre and a tennis court are available. The resort offers water sports like windsurfing and sailing. A grand ballroom, three meeting rooms and two boardrooms are available for hosting business events and also weddings. The Centara Grand Beach Resort Phuket has multiple dining options to satisfy the gastronomic needs of guests. There are seven different dining options for guests. The Cove on the beachfront is an all day restaurant that offers Thai and International cuisine. Coast Beach Club and Bistro offers seafood and wines. Mare is the resorts signature Italian restaurant. Barefoot bar offers a range of cocktails and wines along with salads and light meals. Splash is a swim up bar near the main pool. Ripples near the adults pool, offers cocktails and light snacks. The lobby lounge offers coffee, refreshments and cocktails. The resort offers an awesome holiday experience for tourists, especially families. One can have fun at the water park, dine out at any of the restaurants and spend a relaxing time at the luxurious rooms, suites and villas. A blissful holiday experience awaits tourists who visit this 5-star beach resort. Can airport pick up and drop be arranged by the resort? Yes, airport shuttle services can be arranged on payment of an additional charge. Yes, Wi-Fi internet is provided in the rooms at THB 150 for 24 hours. Yes, free parking is offered to guests at the resort. What is the hotel policy for the stay of children? Are water sport activities available at the resort? Yes, snorkeling, diving, windsurfing can be organized at an additional charge. Water Park is open to all guests. Families dreaming of a grand holiday enjoying water sports and spending time at the beach can enjoy the perfect holiday at Centara Grand beach resort Phuket. The luxurious 5-star resort has 262 rooms, suites and villas for guests. All rooms are air conditioned, spacious and offer satellite TV, minibar, bathtub and shower, coffee machine, safe box and comfortable beds for guests. The resort has a water park where guests can experience hours of joy. Swimming pools, spa, jacuzzi, fitness centre, tennis court, kids playground and games room are the other facilities available at the Centara Grand beach resort. There are many options for business conferences and meetings to be held at the resort. Weddings can also be organized at the resort. There are three restaurants offering variety of cuisines, three bars and a lobby lounge to cater to the taste buds of guests. Indian food is offered here and visitors from India can also visit any of the nearby Indian restaurants. The resort is 45 minutes drive from the Phuket International airport. The beauty of Phukets beaches can be experienced by tourists by staying at the Centara Grand beach resort Phuket, which offers an unforgettable and memorable experience for guests.